The authors designed and used a remote-controlled, electric shock device for human behavior modification after having limited success with the Self-Injurious Behavior Inhibiting System (SIBIS). The new device, the Graduated Electronic Decelerator (GED), incorporates design changes based on the authors’ extensive experience with SIBIS. Improvements include higher intensity, adjustable duration, remote electrodes permitting more body sites for electrode placement, louder stimulation-indicator, feedback signaling of actual skin stimulation rather than simply the receipt of a transmitter signal, greater range, and rechargeable batteries. Measurements were taken of the SIBIS and GED current applied to both resistors and to skin. Electric shock, employed as a decelerative consequence, has proven to be one of the most effective and most thoroughly researched behavior modification tools (Carr & Lovaas, 1983; Favell et al., 1982; Matson & Taras, 1989). In some cases, it has proven to be a life-saving treatment (Beck et al., 1980; Cunningham & Linscheid, 1976; Lang & Melamed, 1969; Watkins, 1972; Worsham, Israel, von Heyn, & Connolly, 1992). Linscheid, Iwata, Ricketts, Williams, and Griffin (1990) have recently summarized the advantages of using shock as a decelerative stimulus. They mention the following: capability of precise quantification; possibility of immediate, remote-controlled application; unobtrusiveness (when used with remote application); the discreteness of the stimulation; and the therapist’s ability to select a safe level of stimulation. These conclusions coincide with that of others (Carr & Lovaas, 1983; Matson & Taras, 1989; Van Houten, 1983). In 1988, we decided to employ electric shock as part of a court-authorized treatment program for several students for whom nonaversive programming, psychotropic medication, and several aversive procedures had previously failed. At that time there were only two commercially-available shock devices designed for use with humans, WhistleStop (Farrall Instruments, Inc., P.O. Box 1037, Grand Island, Nebraska, 68802) and the Self-Injurious Behavior Inhibiting System (SIBIS) (Human Technologies, Inc., 300 3rd Avenue North, St. Petersburg, Florida, 33701). Features of SIBIS discussed in this article are those of units manufactured during 1988-90. Other electric shock devices reported in the literature were either lab-built or designed for animals. Both the SIBIS and WhistleStop consist of a stimulator worn on the student’s body and a remote controller. Two types of remote controllers are available for the SIBIS. One is an accelerometer-activated controller worn by the student in a headband and automatically set off by a blow to the head. The other is a hand-held, button-activated controller. WhistleStop is supplied with only a hand-held controller. We chose the SIBIS for use at BRI because of its recent design by the Johns Hopkins Applied Physics Laboratory in consultation with Linscheid and Iwata (Linscheid et al., 1990), its registration with the Food and Drug Administration as a medical device, and its use of a coded radio signal. This coding prevents the signal from one student’s transmitter from setting off other SIBIS stimulators in use nearby. WhistleStop’s signal is not coded. We chose the hand-held remote controller to activate SIBIS because the inappropriate behaviors we planned to treat included topographies other than head-hitting and because, in treating head-hitting, we wanted to consequate the very earliest phase of any head-hitting behavior. During the period 11-29-88 to 1-31-90, BRI purchased 13 SIBIS units from Human Technologies. BRI staff employed SIBIS with 29 different students, accumulating a total of 335-student-months of experience with the device. The average (median) student used SIBIS for a period of 367 days. Students who used SIBIS wore it 24 hours per day. BRI sent several technicians to the manufacturer’s plant in Florida to be trained in how to repair the units. Linscheid et al. (1990) reported the SIBIS’s current to be 3.5 mA, when applied to a 24 kΩ resistor. They did not specify whether this was the peak current or average current, as would be specified by the root mean square (rms) method. We tested a SIBIS unit purchased in September, 1989. When set at its maximum intensity level, and applied to a 24 kΩ resistor with a fully charged battery, it produced an average voltage of 48.6 volts (rms). Voltages were measured with an oscilloscope (Hitachi, Model VC-6045) and true rms voltmeter (Fluke Scopemeter, Model 97). Current calculated from these values was 2.025 mA (rms). When compared to the shocks generated by WhistleStop and devices designed for use with animals, SIBIS, even when set at maximum intensity and fitted with fresh batteries, delivers a relatively mild shock. Therapists at BRI grew accustomed to testing SIBIS each day on their own thumbs or arms to make sure that it was in working order. Some individuals reported that they could hardly feel the stimulation, or could not feel the stimulation at all. One problem with using a weak electrical stimulus in behavior modification is that it may not be strong enough to decelerate the target behavior. Even if it does have a mildly decelerative effect, numerous applications may be required to accomplish any significant deceleration, and this frequent use increases the likelihood of adaptation. (Azrin, 1956; Hamilton & Standahl, 1969; Holz & Azrin, 1962; Skinner, 1938). Research with both animals and humans suggests that for maximal effectiveness, an electrical stimulus should be as intense as possible, consistent with safety (Azrin, 1960; Carr & Lovaas, 1983; Van Houten, 1983). After using SIBIS for several months, the device appeared to lose its effectiveness with several students, a result we attributed to adaptation. We then modified our units to produce a current of 3.4 mA (rms) when applied to a 24 kΩ resistor. In order to test the actual current of these units when applied to skin, 10 volunteers were enlisted. They each received a SIBIS stimulation while measurements were taken with an oscilloscope. Overall SIBIS voltage was measured, and at the same time the voltage was measured across a 100 Ω precision resistor in series with the skin shock circuit. Actual current was calculated from the latter measurement. The results of these measurements can be seen in Table 1 under the columns with an "S" heading. Both mean and median current of SIBIS stimulations to 10 volunteers were 4.4 mA (rms). Figure 1. 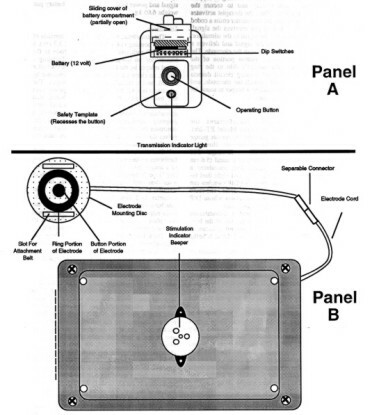 Diagram of GED showing transmitter in Panel A and stimulator, electrode cord, and electrode in Panel B.
SIBIS uses one non-rechargeable 9-volt battery. SIBIS’s receiver board consumes a steady supply of power because it is constantly powered up, waiting for a transmitted signal. This constantly weakens the batteries, even without activation of the unit. Consequently, the actual intensity of any shock depends on the condition of the battery, and this depends on how long the unit has been in use, and on how many shocks have been delivered. When the supply voltage from the battery drops to 8 volts, a low battery indicator beeper sounds. To keep the SIBIS output reasonably constant, we changed its battery every 12 hours. This resulted in additional expense of more than $160.00 per student per month. Frequent changing of batteries also resulted in discontinuities in the wires leading to the battery connector. These occurred either because they broke loose from the solder site or the wire itself broke from the repeated movement stress. Duration of the SIBIS stimulation, for the units supplied to us, was fixed at 0.2 seconds by the manufacturer. User adjustment of duration was not possible. Clinicians using other devices have employed durations ranging from 0.2 s to 2.0 s (Carr & Lovaas, 1983). Research with animals has shown that decelerative effectiveness can be enhanced by increasing the stimulation duration (Church, Raymond, & Beauchamp, 1967). Because SIBIS’s electrode is permanently attached to the housing of the stimulator, the skin sites to which the electrode can be applied are limited to those areas (usually arms or legs) to which the housing can be conveniently attached. The manufacturer supplied us with a cotton pocket for holding the device against the skin, with a Velcro strap which wrapped around the arm or leg. A hole in this pocket, through which the electrode protruded, enabled the electrode to make contact with the skin. The weight of the stimulator often caused it to shift in the pocket, misaligning the electrode and the hole. Sometimes the entire pocket slipped down the student’s leg or arm. We tried replacing the factory-supplied pocket with an elastic wrap to keep the device more securely in place, but this sometimes constricted circulation. SIBIS contains an indicator beeper which sounds when the stimulator receives a coded radio signal from its associated transmitter; however, receipt of this signal does not necessarily indicate that an electrical stimulation has taken place. For example, if the electrode is not making adequate contact with the skin when the stimulator receives the signal, the beeper sounds, but the stimulation is not actually delivered to the student’s skin. Conversely, it is possible for an erroneous stimulation to be delivered to the student without the beeper being activated. For example, if some accidental equipment failure (rather than a signal deliberately sent by the therapist) were to activate the stimulator, the student would receive a shock, but the beeper would not sound. In such a case, the therapist would have no way of knowing that a shock had been delivered to the student, except by the student’s reaction. SIBIS’s indicator beeper is situated inside the housing of the stimulator. The housing muffles the beeper’s sound, and our therapists sometimes could not hear the beeper over the normal sounds of the classroom. As a result, therapists often had to move close to the student when activating the unit to listen for the beeper. Such approaches may inadvertently have provided potentially rewarding attention to the student immediately after having displayed an inappropriate behavior. In such cases the aversiveness of SIBIS may have been reduced or even overridden by the rewarding effects of this attention. 6.1 m. In some cases the range dropped to a meter or less, and its circuits required re-tuning in order to restore normal range. Inadequate range required the therapist to move close to the student, in order to successfully activate the stimulator. Again, these approaches occurring immediately after inappropriate behavior may have had unintended, potentially rewarding countertherapeutic effects. We employed SIBIS with 29 students. For two of these (7%) SIBIS was effective throughout its period of use. For 15 students (52%) SIBIS was effective during an initial period lasting from a few days to a few months; however, it lost its effectiveness thereafter. With one of these students there were indications that SIBIS even reversed its function, changing from an aversive stimulus into a positively reinforcing stimulus. For the remaining 12 (41%) SIBIS showed little or no effectiveness at any time. A more complete summary of our experience with SIBIS is in preparation . In order to remedy the problems described above and have ready access to repair capability and new units, we decided to design our own remote-controlled shock device, called the Graduated Electronic Decelerator (GED). During the period December 1990 to August 1992, BRI manufactured 71 GEDs and used them with 53 different students, accumulating a total of 525 student-months of experience. As of August 1992 the average (median) student had used the device for a period of 10.3 months. When employed in a student’s program, the GED, like the SIBIS, was worn 24 hours per day. Figure 1 is a photograph of the GED components. Shown are transmitter (A), single-output battery pack (B), multiple-output battery pack (C), stimulator (D), electrode cord (E), and electrode (F). Figure 2. Train of direct current pulses of GED and SIBIS, when applied to a 50kΩ fixed resistor. Percentage in first pulse is duty cycle of device. Notice that the GED has a 25% duty cycle (current on) and 75% current off period. When the transmitter button is depressed, a coded radio signal is sent to the stimulator. The stimulator’s receiver circuit decodes the signal, and sends a train of unipolar, rectangular pulses to the electrode. The current passes through the patient’s skin from the electrode’s center button to its outer ring. A current-level sensing circuit detects the passage of this current through the electrode, and causes the stimulator’s stimulation-indicator beeper to sound for the duration of the stimulation. UNSURPASSED ANTENNA MATCHING CAPABILITIES so the receiver is less affected by where mounted. · 2 Mode switches (one for each channel) for easy transmitter learning. · Learns up to 30 transmitters (15 for each receiver channel). · Size: 31/4" x 33/8" x 11/8" (83 x 85 x 28mm). · Operates up to 500 feet (200 meters). · Over 68 billion possible codes. · Size: 21/4" x 11/4" x 1/2" (57 x 32 x 12mm). An operating button and a transmission indicator lamp are located on the transmitter housing. The LED lights when the button is depressed and stays on until it is released, indicating that the signal is being sent. The receiver is much like an FM radio. A code is derived from a signal comprised of high levels and low levels. . The GED’s stimulator will not generate a stimulation until it has received a signal from the transmitter for a continuous period of 0.7 s. This reduces the chance of an unintended application due to a brief, accidental button press. The stimulator weighs 0.31 kg and consists of a plastic housing (14.6 cm x 9.1 cm x 3.3 cm), , a receiver/decoding circuit board set to the same code as the transmitter , a shock controller circuit board, an electrode connected to the stimulator by a cord, and a stimulation-indicator beeper. When the stimulator’s receiver/decoding circuit board receives a properly coded signal, the shock controller circuit generates a train of unipolar pulses through the electrode which activates the stimulation-indicator beeper for the duration of the pulse train, and the LED remains on for two minutes. The electrode cord is made from flat 6-conductor telephone cable (Hirose Electric Co., Ltd., Part # H0063-ND) and connects to the stimulator by a modular connector (6-position offset latch, AMP Model #555237-3). Two types of electrode are currently being used. The first is a "concentric ring" type, similar to that used by the SIBIS and described by Tursky (1965). It consists of a stainless steel button (diameter 9.5 mm, thickness 3.25 mm) inside a stainless steel ring (outer diameter 21.5 mm, inner diameter 16.5 mm, thickness 3.25 mm), with 2.35 mm between the outer edge of the button and the inner edge of the ring. The button and ring are mounted on a plastic electrode mounting disc (60 mm x 19 mm) and protrude 4.0 mm above its top surface. The second consists of two stainless steel buttons (diameter 9.5 mm, thickness 3.25 mm) separated by a varying distance of up to six inches and mounted on flexible nonconductive material. The stimulation-indicator beeper is a Mallory piezoelectric ceramic buzzer (PLD-27A 35W), rated at 95 dB. It is mounted inside the GED’s housing and is loud enough to be heard in a noisy classroom. The student wears a modified "belt pack" (a zippered pouch worn around the waist) which holds the battery pack and stimulator. The electrode cord exits from a small hole in the back of the belt pack. The electrode cord and electrode are normally covered by the student’s clothing. If the electrode is attached to an arm or leg, a limb belt made of a cotton elastic blend is threaded through the two slots in the electrode mounting disc and secured around the arm with a suspender buckle. The electrode can also be attached to the torso using a longer belt. Other equipment has been designed to attach the electrode to the fingers or to the bottom of the foot. These attachment methods eliminate the need for elastic wraps or adhesive bandages to secure the electrode against the skin, enable a maximum amount of air to reach the skin near the electrode, and allow the electrode to be placed at a wide variety of body sites. In choosing parameters for the GED’s electrical stimulation, our goal was to maximize decelerative effectiveness while minimizing any possible adverse effects on the skin. Wherever the shock literature did not contain information concerning decelerative effectiveness, parameters were chosen to maximize perceived aversiveness, as determined by tests on volunteer members of the BRI/JRC staff. All parameters except the waveform’s rectangular shape can be changed by technicians. Waveform. Each GED stimulation consists of a train of rectangular-wave unipolar pulses. A portion of a GED pulse train is depicted in Panel A of Figure 2. A portion of a SIBIS waveform is shown in Panel B of Figure 2 for comparison. Duty cycle. Duty cycle is the percentage of time that a pulse is on during a single on-off cycle. 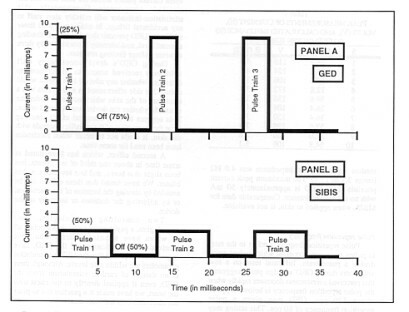 For example, as shown in Figure 2, Panel A, the GED pulse is on for 25% of each cycle. Current is on for 3.125 ms, and off for 9.375 ms. The total time for one cycle is 12.5 ms.
During the design of GED, eight volunteers tested the perceived aversiveness of the stimulation at 10%, 25%, and 50% duty cycles. They reported little perception of aversiveness at a 10% duty cycle, and definite aversiveness at 25%. They found the 50% duty cycle only slightly more aversive than the 25% duty cycle. Because the 50% duty cycle was thought more likely to cause skin irritation and was judged to be only slightly more aversive than the 25% duty cycle, we decided upon a 25% duty cycle for the GED. The duty cycle may be adjusted from 1% to 90%. Current. When operated across a 24 kΩ resistor, the GED produces a voltage of 106.3 V (rms), and a current of 4.42 mA (rms). The corresponding peak values are 272 V and 11.33 mA. In order to find out the level of current during actual stimulations, tests were conducted on 10 BRI staff members, who volunteered to participate. Each volunteer received one 200 ms application of GED to the forearm. Previous testing at BRI had shown that peak current was reached within the first 200 ms of a stimulation to the skin. The same measurements were taken as described earlier for actual SIBIS stimulations. Table 2 shows the results under the columns headed "G.". The median peak current for the volunteers was 29.2 mA (range 12.8 mA to 39.6 mA), and the mean was 29.6 mA. Median and mean rms currents were 14.6 mA and 14.8 mA, respectively. The median impedance for the 10 volunteers was 4.0 kΩ (range 3.1 kΩ to 13.4 kΩ); the mean was 5.0 kΩ. The maximum peak current possible from GED, measured by applying GED to a 100 Ω resistor, was 56 mA. This level of current would not be generated when the device is applied to the skin, however, because skin has a typical impedance of two to five kΩ. Pulse repetition frequency. Pulse repetition frequency refers to the rate, in pulses per second (pps), at which pulses occur within a pulse train. Informal tests on a few volunteers during GED’s design phase suggested that perceived aversiveness decreases rapidly when the pulse repetition frequency is below 40 pps or above 120 pps. GED was given a pulse repetition frequency of 80 pps. (80 Hz) This setting may be adjusted by a technician to any value between 40 and 120 pps. Duration. The duration of a single GED stimulation is completely adjustable. We have selected a duration of 2.0 seconds for the typical application. For our test purposes, we use a 5 k Ω. load (5000 ohms), which most closely simulates average skin resistance. This produces 65 vrms output with a median current of 13 mA for the GED and a 130 vrms output with a median current of 26 mA for the GED-4. GED’s stimulation-indicator generates a tone only if current passes through the skin between the stimulator electrodes. Consequently, it reliably alerts staff to any accidental firings. In addition a dual timer prevents the duration from exceeding a preset level, and intensity is limited by a voltage limiting varistor and a current limiting resistor. During the GED’s development several BRI staff members volunteered to receive stimulations to evaluate possible adverse side effects to the skin. One side effect noted in a few cases was a browning of the skin immediately under the electrode. This occurred whether the device was operated or not, and appeared to be a chemical effect resulting from the interaction of the metallic electrode with the skin. It tended not to occur when electrodes had been used for some time. A second effect, which has been noted at some time in about one third of our students, has been slight erythema and, in a few cases, a skin blister. We have found that these effects can be avoided by altering the location of the electrodes or by adjusting the duration or voltage of the device. Two consulting cardiologists, two neurologists, a psychiatrist, and a pediatrician, all of whom have examined students who have received many applications of the GED, have expressed the opinion that the GED’s stimulation parameters are within safe levels. Although there is no danger of cardiac stimulation from the GED, even if applied directly to the chest over the heart, we have made it a practice not to place the electrodes over the heart area. Azrin, N. H. (1956). Effects of two intermittent schedules of immediate and nonimmediate punishment. Journal of Psychology, 42, 3–21. Azrin, N. H. (1960). Effects of punishment intensity during variable-interval reinforcement. Journal of the Experimental Analysis of Behavior, 3, 123–142. Beck, G. R., Sulzbacher, S. I., Kawabori, I., Stevenson, J. G., Guntherof W. G., and Spelman, F. A. (1980). Conditioned avoidance of hypoxemia in an infant with central hypoventilation. Behavior Research of Severe Developmental Disabilities, 1, 21–29. Butterfield, W. H. (1975). Electric shock hazards in aversive conditioning of humans. Behavioral Engineering, 3, 1–28. Carr, E. G. and Lovaas, O. I. (1983). Contingent shock treatment for behavior problems. In S. Axelrod & J. Apsche (Eds. ), The effects of punishment on human behavior. (pp. 221–245). New York: Academic Press. Church, R. M., Raymond, G. A., and Beauchamp, R. D. (1967). Response suppression as a function of intensity and duration of a punishment. Journal of Comparative and Physiological Psychology, 63, 39–44. Cunningham, C. E. & Linscheid, T. R. (1976). Elimination of chronic infant ruminating by electric shock. Behavior Therapy, 7, 231–234. Favell, J. E., Azrin, N. H., Baumeister, A. A., Carr, E. G., Dorsey, M. F., Forehand, R., Foxx, R. M., Lovaas, O. I., Rincover, A., Risley, T. R., Romanczyk, R. G., Russo, D. C., Schroeder, S. R., and Solnick, J. V. (1982). The treatment of self-injurious behavior. Behavior Therapy, 13, 529–554. Hamilton, J. & Standahl, J. (1969). Suppression of stereotyped screaming behavior in a profoundly retarded institutionalized female. Journal of Experimental Child Psychology, 7, 114–121. Holz, W. C., and Azrin, N. H. (1962). Recovery during punishment by intense noise. Psychological Reports, 11, 655–657. Lang, P. J. and Melamed, B. G. (1969). Avoidance conditioning therapy of an infant with chronic ruminative behavior. Journal of Abnormal Psychology, 74, 1–8. Linscheid, T. R., Iwata, B. A., Ricketts, R. W., Williams, D. E. & Griffin, J. C. (1990). Clinical evaluation of the self-injurious behavior inhibiting system (SIBIS). Journal of Applied Behavior Analysis, 23, 53–78. Matson, J. L. & Taras, M. E. (1989) A 20-year review of punishment. Research in Developmental Disabilities, 10, 85–104. Skinner, B. F. (1938). The behavior of organisms. New York: Appleton. Tursky, B., Watson, P. D., and O’Connell, D. N. (1965). A concentric ring electrode for pain stimulation. Psychophysiology, 1, 296–298. Van Houten, R. (1983). Punishment: From the animal laboratory to the applied setting. In S. Axelrod & J. Apsche (Eds. ), The effects of punishment on human behavior. (pp. 13–44). New York: Academic Press. Worsham, R. W., Israel, M .L., von Heyn, R. E., and Connolly, D. A. (1992). Treatment of life-threatening vomiting and rumination with contingent electric shock. Unpublished manuscript. Watkins, J. T. (1972). Treatment of chronic vomiting and extreme emaciation by an aversive stimulus: case study. Psychological Reports, 31, 803–805. Matthew L. Israel conceived of the GED and prepared the final manuscript. Robert von Heyn designed and supervised the parametric testing and assisted in the manuscript preparation and editing. Dan Connolly assisted in the parametric research and the manuscript preparation and editing. David Marsh designed the GED. The authors gratefully acknowledge the technical contributions of Chris Mello, Richard Levinson, Vandy Sou, Dan Hey, and Karl Weisker in the design of GED, and Thomas Kearney for his exhaustive researching of the shock literature. In addition, the comments of Bob Worsham on the manuscript, and the advice of Drs. Paul E. Zoll and Tadeusz Gotlib concerning the safety of GED, were invaluable.